The Seattle Aquarium requested a Sani-Tech Auger Compactor in 2003. Being local, it was easy to manufacture and deliver their Model ST524 in a short manner of time. With the aquarium being all about keeping the water blue, we jumped on board with their environmentally friendly policies. Proud to offer machines that use absolutely no hydraulic oil, we got to work right away for the Puget Sound marine life company. Being that their business generates refuse at a slower rate we decided together that our smaller model was best suited for their facility. They had a specific color in mind, blue; which has so much meaning to the Seattle area, with the Seahawks showcasing blue and green, and more importantly with their dedication to keeping water blue for all marine animals. This Pacific Northwest Auger is being stored this year during the aquarium’s new seawall project while there’s no access for a hauler. "Our Auger Compactor works well and has a 6 yard bin attached. The bin has wheels and probably gets emptied about 2 days a week. We do generate more in the summer and less in the winter. 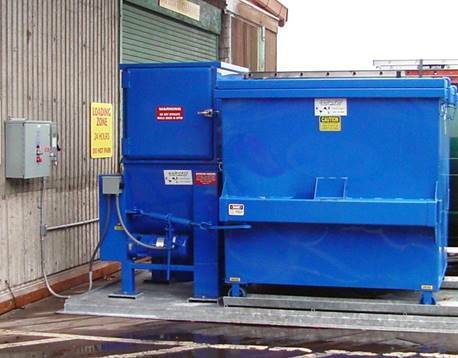 Our Compactor was installed about 15 years ago and is currently in storage while we work on our new Seawall project."